Good Toronto house painters can not only do house painting but also can perform drywall repairs. I can’t imagine not being able to do drywall repairs and just only having the ability to just paint. These days everyone has to diversify and be able to do more than one task to be able to stay competitive and in business. I recently had a customer who had mold growing on their ceiling in the kitchen. This mold actually existed above the ceiling in the rafters. They had to have a company come out and thoroughly remove and wash and then disinfect the entire area above the kitchen. To be able to access the affected area in the rafters over the kitchen they had to remove the section of wall and a section of the ceiling above the countertops. There was a nice clean space where the studs and the rafters and ceiling joists were all the exterior walls were clean and all the boards were very clean. But unfortunately they did not put the wall of the ceilings back and that is why the customer/homeowner called me to replace the ceiling and the walls in the kitchen. This company even though they did a nice job on cleaning the area they did a bad job on making a nice square symmetrical opening in the ceiling and walls. When you have a ceiling with a irregular shaped opening is difficult to put in a piece of drywall of that shape. Therefore you have to enlarge the opening to make it dimensionally square making it easy to be able to duplicate an insert of that size. Toronto house painters install fiberglass and vapor barrier for maximum efficiency. In this instance we had to place some R – 20 fiberglass insulation and some vapor barrier to prevent moisture from coming in and breeze. After measuring the openings where the drywall was cut out we cut some fresh half inch and 5/8 drywall the same size. Normally when an experienced person cuts out drywall they cut its right beside the stud or rafter then they make another cut to divide the stud widths in half, this will allow the other piece of drywall to be placed over the wood and screwed in. 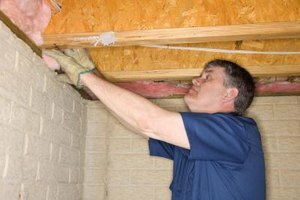 And if not then it additional piece of wood can be applied to the side of the start or the side of the rafter to have something to screw into when you are applying the drywall. After you have totally done and made sure that you have a place for the drywall to be screwed to then you can apply the vapor barrier. Places where the vapor barrier joined or meet can be covered with some special plastic tape to help seal the connection. Now that everything is done you are ready to install the pieces of drywall. On small piece of drywall it is easy to hold the drywall up with one hand and use a screw gun with the other hand but when the pieces get a little bit too big sometimes it’s easier to use a adjustable pole to hold up the drywall while it is being screwed on. Taping a plastering should be a simple process for the professional painter. The professional painter should know exactly how good a job they have to do with the taping and plastering to make their paint job look good. And that is that all the joint should be smooth and flush with the surface with no bumps or tape showing through. Priming all the fresh drywall and plaster is important because if you don’t prime these areas then you will see flash marks where the plaster and drywall meet. The plaster marks always look duller with less shine than the rest of the drywall. Last step is to paint the walls. And in this case the wall should be painted with a kitchen paint such as Benjamin Moore or Sherwin-Williams paint.